Pediatric ENT of Oklahoma is a comprehensive ENT clinic dedicated to the treatment of pediatric ENT disorders. 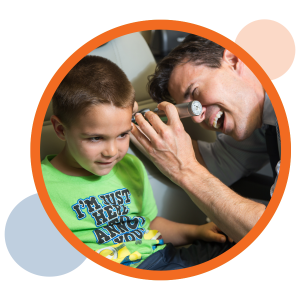 Located in northwest Oklahoma City, Pediatric ENT of Oklahoma has a staff of skilled healthcare providers led by fellowship-trained and board certified pediatric ENT surgeons, Dr. Paul Digoy and Dr. Robert Glade. We specialize in the diagnosis, treatment and follow-up care of a variety of ENT disorders including tonsilitis, adenoiditis, cleft lip and palate repair, airway obstructive disorders, sleep apnea and speech therapy.